Software radio is a really big important technology. Don't take our word for it—try this simple project. Got your ham license? Let your Linux box join the fun too, with the latest digital radio mode. 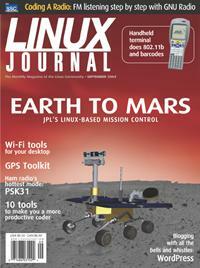 Rovers don't run Linux yet, but back on Earth, Linux is the platform of choice for planning their routes and collecting data. Where on Earth are you? Do you need to know with better precision than an off-the-shelf GPS unit? Here's the software that can help you. Make the most of your satellite radio subscription with a friendly GUI for picking stations and more. Making quality software requires simplifying and automating common tasks to save your time for the hard parts. Use one tool to create and modify accounts for your Linux and Microsoft Windows users. Practical advice on how Linux fits into a wireless R&D operation, from a “boat anchor” cluster for numerical simulations to the latest generation of embedded ARM processors.